Peregrines at Pitt: Where should I look to see them? 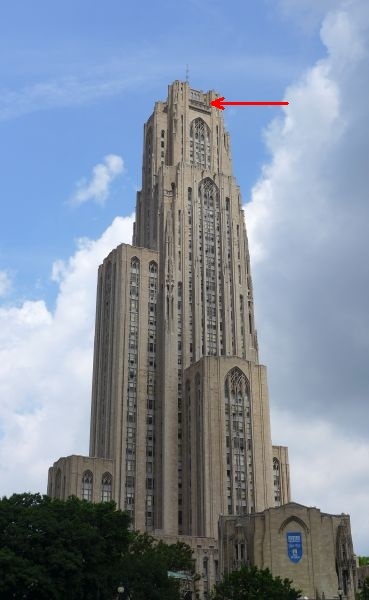 Question: Where should I look to see the peregrines at the University of Pittsburgh? Look high up on the Cathedral of Learning. If you see a bird perched on the antenna, it’s a peregrine. If you see a bird at or near the top, it’s a peregrine. No other birds dare fly up there because the peregrines will attack or eat them. This applies at all times of year. The best place to stand when looking for them is at Schenley Plaza, the park between Hillman and Carnegie Libraries and across the street from the Cathedral of Learning. It helps to be closer to the tent than to Forbes Ave.
Don’t attempt to see the peregrines from inside the building. You can’t see the nest from any window and it’s illegal to disturb the birds. And you can’t run from floor to floor as fast as a peregrine can fly so you’ll miss them. Truly, the best way to see the peregrines is from the ground. Look at the antenna (actually a lightning rod) on top of the building. If there’s a lump on one of its perches that’s a peregrine, so look closely. Follow the antenna down until you see 3 windows with the sky showing through them. Those windows have golden lights at their base. Look below the windows and you’ll see a roof. Look below the roof and you’ll see a wall with 5 architectural cutout designs. This area is where they’re likely to be. The top of the wall is called the “nest rail.” This is where the parents perch to look down on the nest and where the youngsters practice flapping their wings and making small test flights before they fledge. The architectural cutouts are called the “keyholes.” Look in the far right keyhole. There is sometimes a peregrine perched inside it. Note! During the nesting season, it is very important to watch from the ground, not from inside a window. A nestling that’s frightened by seeing a human may leap off the building before it can fly and fall to its death. Thanks for the visual, Kate. It really helps. I didn’t realize the peregrines were at the tippy top!